Perhaps our most luxurious product. 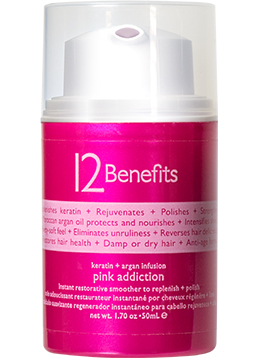 12 Benefits™ pink addiction is the perfect oil-in-cream blow dry or air dry styler. Soft to the touch with a supple texture, pink addiction contains only 7 specially selected ingredients. New Zealand keratin and African argan oil help reverse hair deficiencies and provide anti-frizz therapy. Velvety-soft pink addiction instantly calms cuticles and polishes the hair surface. It is ideal for stronger hair textures, curly textures, or chemically altered hair. Our oil-in-cream is salt and sulfate free, contains no additives, and should be used to maintain frizz-free hair following hair straightening services. Directions for use: Apply 1-2 pumps to palms (1 pump short to mid-length hair, 2 pumps long hair). Spread through damp hair lengths. Blow dry or air dry style. Use on dry hair to smooth cuticles.